The surface of a freshwater lake in daylight. Freshwater is a term for water that has no appreciable salinity; that is, a low salt concentration. This is variously defined as less than 0.5 parts per thousand dissolved salts (GF 2008; ONR) or less than 1,000 parts per million (UCAR), or other salinities (UCMP). This is in contrast to saline water as seen in the case of the ocean, which averages 35 parts per thousand, with the term brackish water used for intermediate salinities between freshwater and salt water. 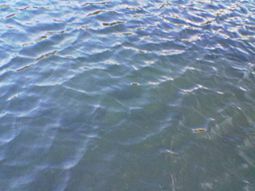 Freshwater bodies of water, such as ponds, lakes, rivers, and streams, contain low concentrations of dissolved salts and other total dissolved solids. Freshwater is an important renewable resource, necessary for the survival of most terrestrial organism, and is required by humans for drinking and agriculture, among many other uses. Unfortunately, the United Nations estimates that about 1.2 billion people (18 percent of the world's population) lack access to safe drinking water (DPI 2006). With the water cycle continually producing freshwater, the vast amount worldwide, and the development of techniques such as desalination to produce freshwater, access to potable freshwater should be solvable. However, factors such as uneven distribution, overconsumption, and water pollution have exacerbated the problem of water shortage. And pollution, man-made erosion, and draining of wetlands for intensive commercial, residential, and agricultural uses has resulted in risks to rivers, streams, and wetlands, making some freshwater ecosystems among the most endangered habitats (EPA 2007). Different bodies of water have different amounts of dissolved salts; that is, different salinities. The salinity, or concentration of salt in the water, can be expressed as parts per million (ppm), or parts per thousand (ppt), or as a percentage of salt. For example, one gram of salt in 1,000 grams of water yields a salinity of 1 part per thousand. The technical term for saltiness in the ocean is salinity from the fact that halides—chloride specifically—are the most abundant anions in the mix of dissolved elements. In oceanography, it has been traditional to express salinity not as a percent, but as parts per thousand (ppt or ‰), which is approximately grams of salt per liter of solution. Other disciplines use chemical analyses of solutions, and thus salinity is frequently reported in mg/L or ppm (parts per million). Freshwater is variously defined and there is not an authoritative standard. For example, the Groundwater Foundation (GF) and the United States Office of Naval Research (ONR) defines a freshwater salinity as water with less than 0.5 parts per thousand of dissolved salts. The University Cooperation for Atmospheric Research (UCAR) defines freshwater as less than 1,000 parts per million (1 part per thousand). The University of California Museum of Paleontology (UCMP) defines it as less than 1 percent, though this is unusually high. Freshwater bodies include lakes and ponds, rivers, some bodies of underground water and many kinds of man-made freshwater bodies, such as canals, ditches, and reservoirs. The ultimate source of freshwater is the precipitation of atmosphere in the form of rain and snow. The Office of Naval Research further defines brackish water as water between 0.5 ppt and 17 ppt. Ocean water has a salinity of approximately 35,000 parts per million, which is equivalent to 35 parts per thousand or about 3.5 percent salt. This number varies in reality roughly between 32 ppt and 37 ppt, with rainfall, river runoff, evaporation, and ice formation among factors (ONR). The Black Sea, for example, is substantially diluted by river runoff and has an average salinity of only 16 ppt (ONR). There are also other means of measuring salinity. In oceanography prior to 1978, salinity or halinity often was expressed as a percentage, usually based on the electrical conductivity ratio of the sample to "Copenhagen water," an artificial sea water manufactured to serve as a world "standard" (Lewis 1980). In 1978, oceanographers redefined salinity in the Practical Salinity Scale (PSS) as the conductivity ratio of a sea water sample to a standard KCl solution (UNESCO 1981a; UNESCO 1981b). One could then address ocean water as having a salinity of approximately 35 psu (practical salinity units) (UCAR). Ratios have no units, so it is not the case that a salinity of 35 exactly equals 35 grams of salt per liter of solution (UNESCO 1985). These seemingly esoteric approaches to measuring and reporting salt concentrations may appear to obscure their practical use; but it must be remembered that salinity is the sum weight of many different elements within a given volume of water. It has always been the case that to get a precise salinity as a concentration and convert this to an amount of substance (sodium chloride, for instance) required knowing much more about the sample and the measurement than just the weight of the solids upon evaporation (one method of determining "salinity"). For example, volume is influenced by water temperature; and the composition of the salts is not a constant (although generally very much the same throughout the world ocean). Saline waters from inland seas can have a composition that differs from that of the ocean. For the latter reason, these waters are termed saline as differentiated from ocean waters, where the term haline applies (although is not universally used). Access to unpolluted freshwater is a critical issue for the survival of many species, including humans, who must drink freshwater in order to survive. Only three percent of the water on Earth is freshwater in nature, and about two-thirds of this is frozen in glaciers and polar ice caps. Most of the rest is underground and only 0.3 percent is surface water. Freshwater lakes, most notably Lake Baikal in Russia and the Great Lakes in North America, contain seven-eighths of this fresh surface water. Wetlands have most of the balance, with only a small amount in rivers, most notably the Amazon River. The atmosphere contains 0.04 percent water (Gleick and Schneider 1996). In areas with no freshwater on the ground surface, freshwater derived from precipitation may, because of its lower density, overlie saline ground water in lenses or layers. Desalination (or desalinization) refers to any of several processes that remove excess salt and other minerals from water. Water is desalinated to obtain freshwater suitable for animal consumption or irrigation, or, if almost all of the salt is removed, for human consumption. Most of the modern interest in desalination is focused on developing cost-effective ways of providing freshwater for human use in regions where the availability of water is limited. Freshwater creates a hypotonic environment for aquatic organisms. This is problematic for some organisms, whose cell membranes will burst if excess water is not excreted. Some protists accomplish this using contractile vacuoles, while freshwater fish excrete excess water via the kidney. Although most aquatic organisms have a limited ability to regulate their osmotic balance and therefore can only live within a narrow range of salinity, diadromous fish have the ability to migrate between freshwater and saline water bodies. During these migrations they undergo changes to adapt to the surroundings of the changed salinities; these processes are hormonally controlled. The eel Anguilla anguilla uses the hormone prolactin, while in the salmon Salmo salar the hormone cortisol plays a key role during this process. Department of Public Information (DPI). 2006. Theme of world water day "water and culture," Secretary-General says in message for international day. United Nations. Retrieved June 2, 2008. Environmental Protection Agency (EPA), United States. 2007. Freshwater ecosystems. United States Environmental Protection Agency. Retrieved June 3, 2008. Gleick, P., et al. 1996. Freshwater. In S. H. Schneider, Encyclopedia of Climate and Weather. New York: Oxford University Press. ISBN 0195094859. Groundwater Foundation (GF 2008). 2008. Groundwater glossary: Freshwater. Groundwater Foundation. Retrieved June 3, 2008. Lewis, E. L. 1980. The Practical Salinity Scale 1978 and its antecedents. IEEE J. Ocean. Eng. OE-5(1): 3-8. Office of Naval Research. n.d. Ocean water: Salinity. Office of Naval Research. Retrieved June 3, 2008. UNESCO. 1985. The International System of Units (SI) in Oceanography. Tech. Pap. Mar. Sci. 45: 124 pp. UNESCO. 1981a. The Practical Salinity Scale 1978 and the International Equation of State of Seawater 1980. Tech. Pap. Mar. Sci. 36: 25pp. UNESCO. 1981b. Background papers and supporting data on the Practical Salinity Scale 1978. Tech. Pap. Mar. Sci. 37: 144 pp. University of California Museum of Paleontology (USMP). n.d. The freshwater biome. University of California Museum of Paleontology. Retrieved June 3, 2008. University Corporation for Atmospheric Research (UCAR). 2002. Salinity: Dissolved salts, measuring salinity. Regents of the University of Michigan. Retrieved June 3, 2008. This page was last modified on 12 May 2017, at 22:01.